Looking down at my gear shifter, sighing – damn those magic fairies, why didn’t you fix it overnight?! Sitting down on the cold concrete driveway, I get to work to remove the gear shifter from the spline. Pulling it completely off I see why it no longer changes gears. Where once it was like a saw blade is now completely smoothed off on both the spline and the gear shifter. 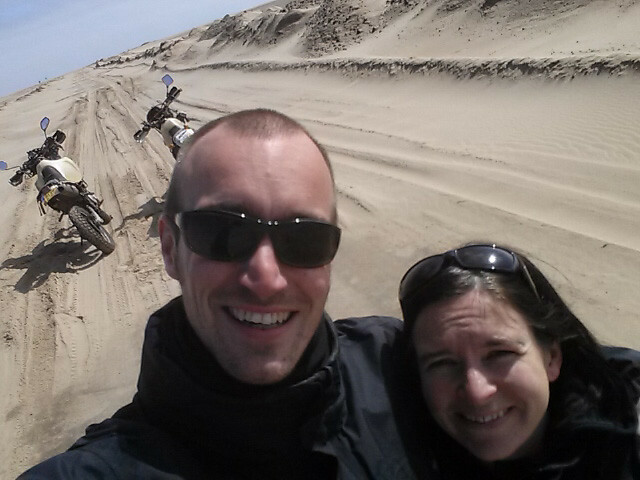 I jump on the back of Mike’s bike and we ride down to the only motorcycle shop in Swakopmund, Dune Worx – Yamaha. Straight away, I am blown away how friendly the staff is here, they have a spare Yamaha shifter, but they won’t know if it fits until I bring my bike down and we try to slide it onto the shaft. They take my old worn out shifter and cut a larger slit into it and hand me a longer bolt. “Take this back to your bike, install it and tighten it up as much as you can and you may be able to ride the bike back”. It works, I am amazed at the difference about how tight it is to change gears, but I know it won’t last the distances I need. Back at the Yamaha shop, we find the replacement gear shifter will not work, the spline is too far gone. They give me two options, either weld it on for good or replace everything. It takes me a couple of days to decided what I wanted to do. In the end I decide to replace everything. I know if I weld it up, next week something will happen to my engine, and I will have to grind it off. It’s just better to do it properly once and for all. But this brings up another problem. Dune Worx mentioned that Suzuki Windhoek are useless at ordering parts and I will be waiting years to get anything from them, to prove their point, they show me a shed full of Suzuki bikes waiting on parts from this one shop in Windhoek. I guess I will have to either order the parts in South Africa or further abroad, like the Netherlands. 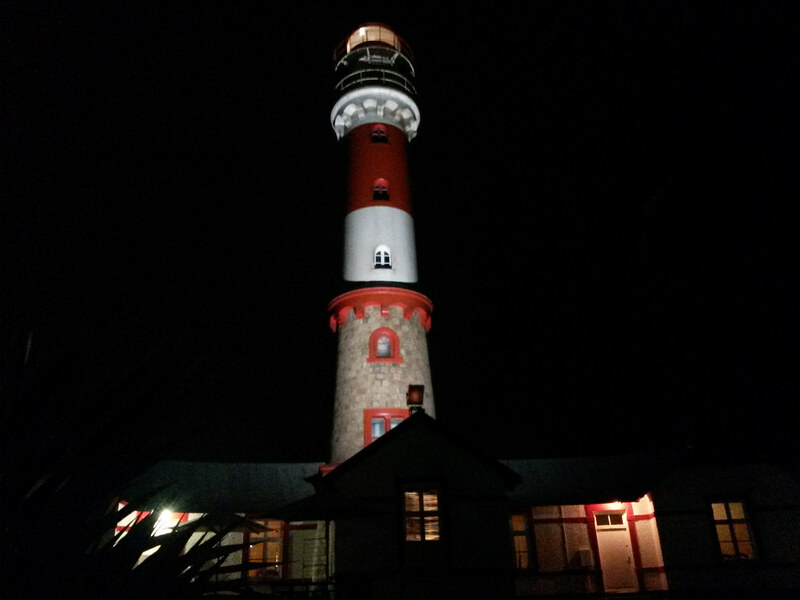 Swakopmund’s lighthouse with a yummy restaurant inside it. After a couple of days trying to reach my motorcycle shop contacts in South Africa, I give up and ask Bob in the Netherlands to gather up all the parts I need and send them down to me. Thankfully for me, Bob is totally on the ball and has everything packed up and in the post less than a week later. Now the waiting begins, the first week slips past, then week two. Mike and I keep ourselves busy with our companies but after the third week I start getting fed up. There is nothing showing up on the tracking number, and the post office tells me I need to wait up to six whole weeks before complaining! Finally after the fourth week, I see my package has arrived in Windhoek, the capital of Namibia, less than 400 kilometers away and then the tracking number goes silent once again. 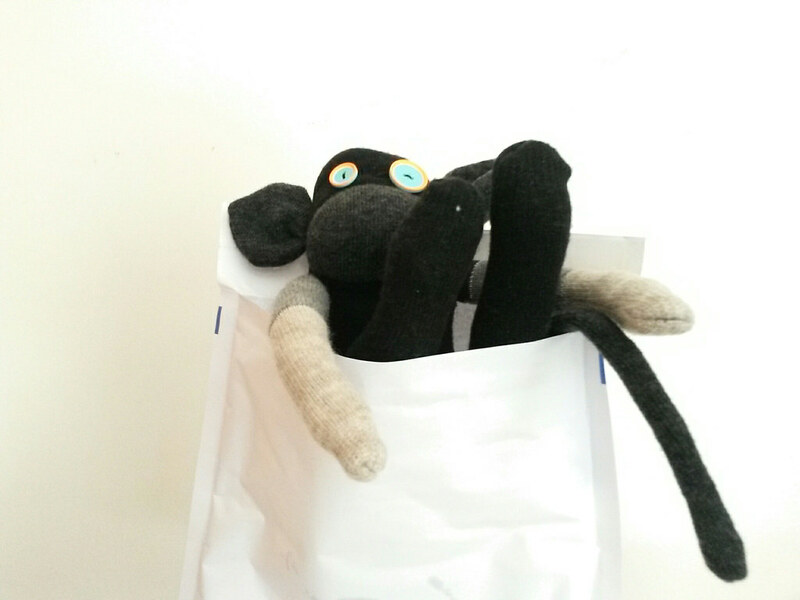 This little sock monkey got sent to Bob in the Netherlands to say thanks for all your help! Standing in front of the post office lady, I ask where my package is, and why hasn’t it arrived in Swakopmund if it was in Windhoek over a week ago. “Didn’t you get a slip in your post box?” lying between my teeth, I say “No, I didn’t get one” I didn’t actually have a post box, I was using the motorcycle shops address, and while standing in the queue I noticed for the first time posters saying “You do not share your credit card pin why would you share your box!” The lady interrupts my thoughts “you should have got one on Monday” and walks into the back room. A few minutes later she reappears with my package in one hand, and her phone in the other. After giving me the package, she dismisses me with a wave, she’s now concentrating on talking to her friends. Of course by now, it’s friday afternoon, too late to take my bike down to the shop. I will have to wait until Monday. Monday morning rolls around, Mike and I gather everything to take to the shop, all geared up we discover my bike will not start. I check all the usual suspects, but find nothing obviously wrong. We attempt to get it started with a push but that only resulted in exhausting ourselves. Time for plan C. Mike gets his bike and parks it in front of mine. We tie a tie down to his bike and wrap it around my handlebar – this is designed so if I get into trouble, I can just let go and glide to a stop. However, when Mike takes off, I feel the jank and my bike comes down and I leap off just in time to avoid any tears. 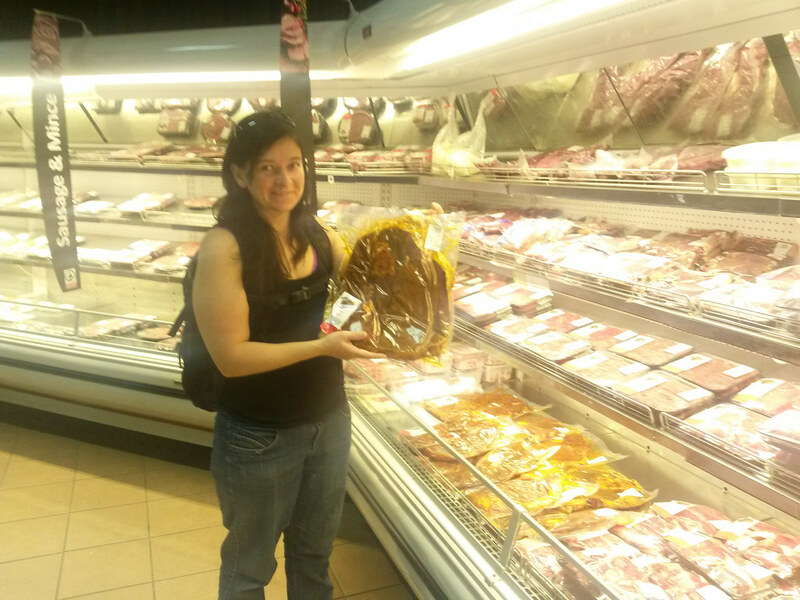 I had completely forgotten to let go! For plan D, we get my bungy cord and tie that to Mikes bike, then attached the tie down to that and once again wrap it around my handle bar. This will hopefully take out the initial jank when Mike first takes off. It works, we head around the first corner, and around the second corner. The handlebar is getting pulled extensively and I am feeling the strain in my neck as I pull back hard on that side and push equally as hard but in the opposite direction on the other side. I follow Mike up a hill, but at this point I can not hold the bike steady and start to wander from side to side. I let go of the tie down that’s under my hand but it doesn’t release. 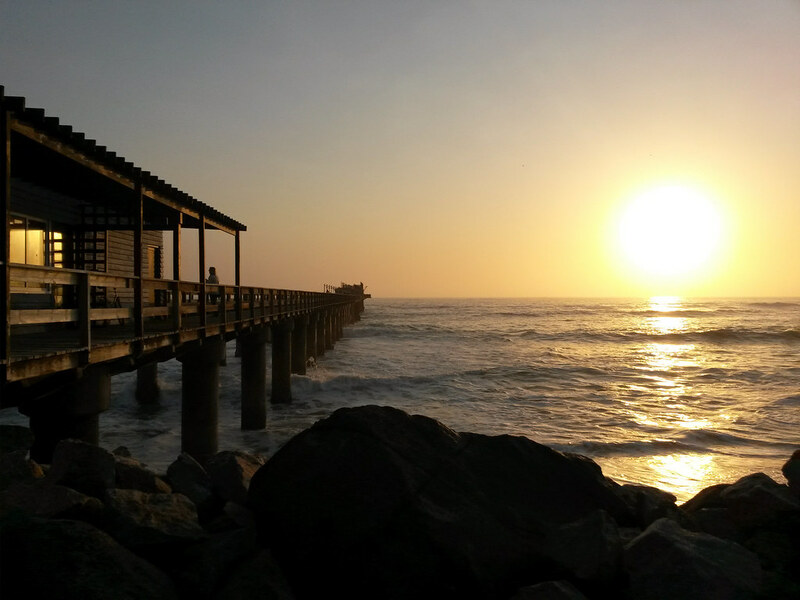 Sunset into the ocean at the pier! I come crashing down, into the dirt hard with my bike. I leap up quickly, but the frustration and the pain bring tears to my eyes. I tear my helmet off and sit down on the gutter. Leaving my bike in the middle of the road. There’s no traffic in Swakopmund anyway. I don’t understand, Mike towed me for over 700 kilometer two years ago, but we can not even make the three kilometers to the bike shop. Mike picks up my bike for me and then comes and wraps his arms around me trying to comfort me as the tears keep coming. “Let’s just go on my bike” Mike says to me “and get them to pick the bike up” . We should have done this in the first place! The mechanic comes with one of his workers, they discover the spark plug cable had come out of the socket, and with a bit of kicking the bike starts. I feel incredibly stupid now. They take the bike to the shop, with my new parts. Then two more weeks slowly drain past, I go back into the workshop to find out where we are at and why I haven’t heard from them. 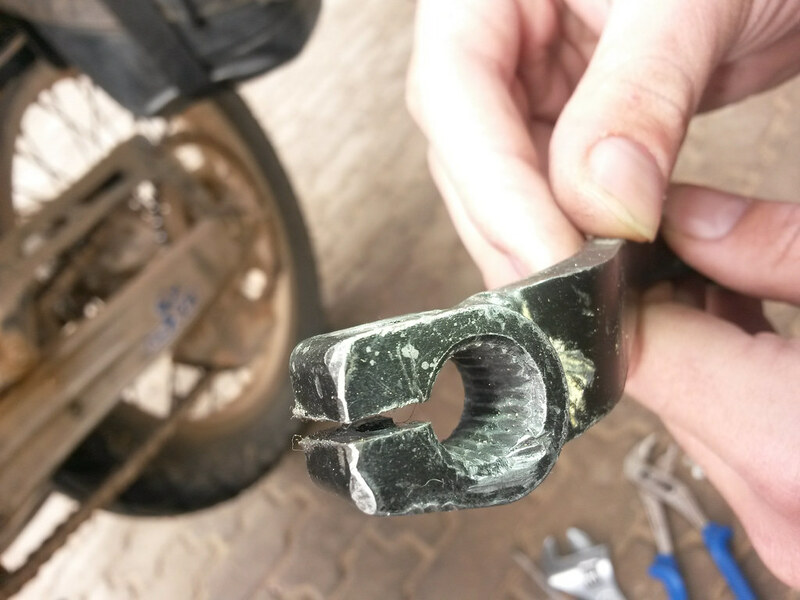 Apparently, the oil seal behind the front sprocket leaks too badly, so they had to order in one from South Africa. But they forgot to put the seal in the post. Then it was the wrong one and now we are waiting on the right one. By this time, I am completely frustrated at this whole ordeal. The next day, we plan to celebrate Mikes birthday, with croissants for breakfast followed by a champagne picnic for lunch and ending the day having sundowners at the lighthouse. However, all our plans change when the phone rings and the bike shop told me, my bike is ready! 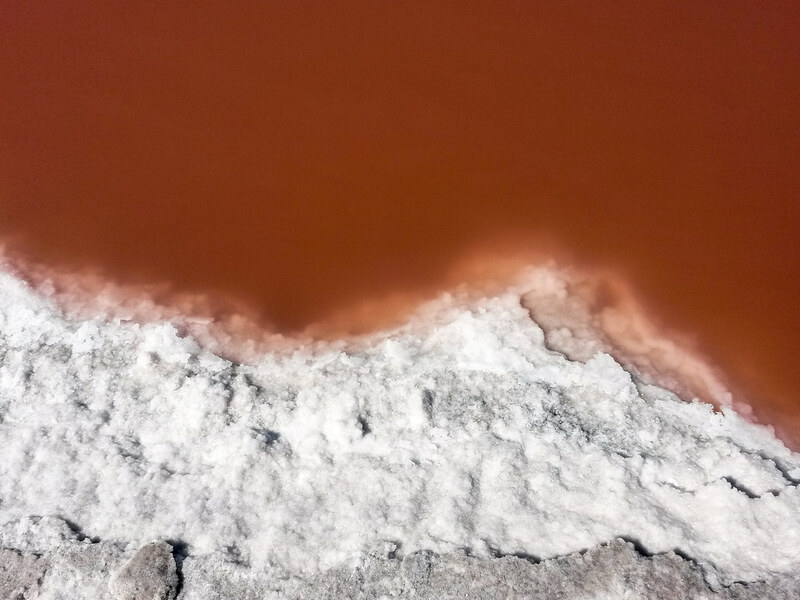 We quickly pack for a ride out to Walvis bay some 30 kilometers south of Swakopmund, where we can visit the salt works and the pink flamingos. It’s a perfect day, and it sure feels good to have my motorcycle back. 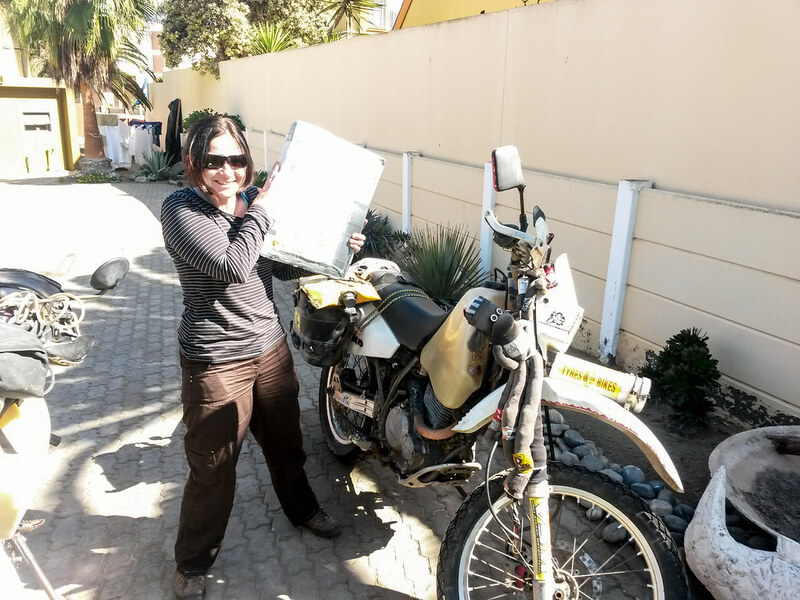 We will spend the following day packing and then leave Swakopmund seven whole weeks after we first arrived! Mike and I on a ride out on his birthday – look at that awesome sandy road to the point! Lovely. Brilliant read. So sorry your bike fell apart there, but I guess you now know that little place inside out! Hope Mike’s birthday was wonderful. Can’t wait for the next instalment. 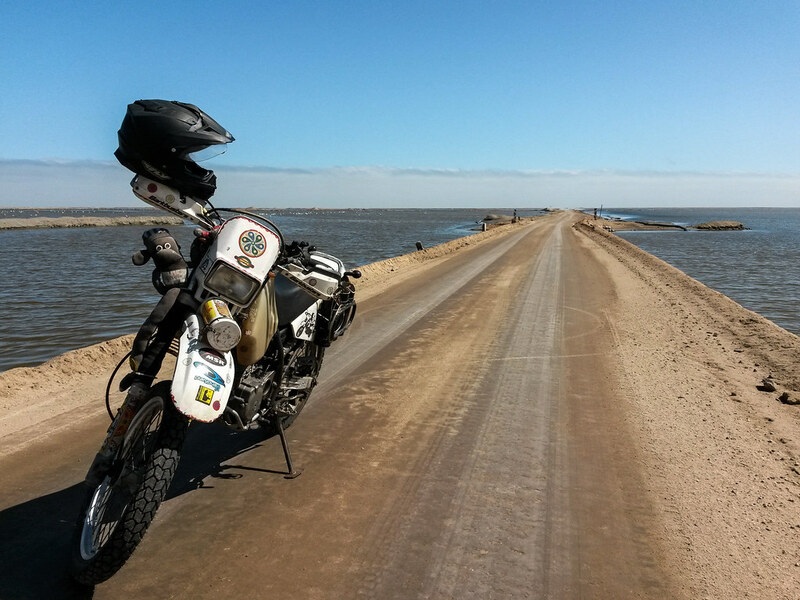 Hey motomonkey – Sorry to hear the bike troubles! Keep the faith! 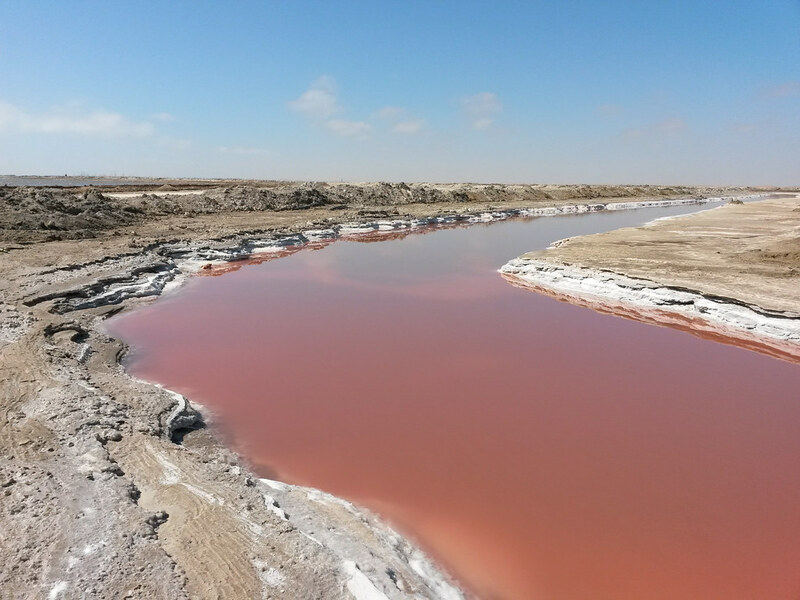 I came down the west coast a few months ago on a DR650 and stopped at the same shop for some stuff and went surfing out by those salt pans in Walvis. Love the blog – keep it up! Hi Oscar, haha, yes – it is still embarrassing that I failed this time! Hi Gary, Thanks for that, its all part of the journey isn’t it! Hi Sue, Yeah – it is hard to write about the frustration. But Mike and I also work while traveling so we both knuckled down and worked on a few projects. Hello Chriss, Thanks a lot – in actual fact i am glad it broke down in a town rather than the middle of the desert! Thanks Tony, its nice to hear from you. I hope you get back into the saddle soon! Hi Brian, Thats cool – I love Namibia – speaking from the future we spent four whole months there! Would have spent some more time IF we could extend our visas some more! Its definitely a place to come back to in the future!.